The A8 L is an elegantly advanced car. The L in the name stands for ‘Long wheelbase’ and that’s what it really does. Measuring 207.4 inches, the extra length has resulted in more rear-seat legroom. The big sedan comes with power reclining seats that can offer you a massage, with provision for seat ventilation, and a full length rear center console with MMI® and seat controls. The A8 L also comes with twin Rear Seat Entertainment screens for all your multimedia needs. The A8 L is designed to be chauffeur-driven but if you intend to get behind the wheels, then driving the new Audi will surely make you say ‘I feel like God’. The Audi Drive Select® puts you on the throttle for a more enhanced experience. With the touch of a button, the Audi Drive Select changes handling and response and lets you drive that suits your mood. With five different modes at disposal, one can select to drive with Efficiency, Comfort, Dynamic, Auto or on Individual mode. The Efficiency mode optimises gear changes, air conditioning, and engine programming to promote a more economical driving style. Comfort adjusts your set-up to create a more relaxing ride. Option Dynamic gives you sportier experience changing characteristics of the steering, engine response, transmission and suspension. The Auto mode adapts the system depending on the current driving situation while Individual, which is available in conjunction with a Satellite Navigation system, allows you to configure the dynamics of the car to your own preferences depending on what special equipment is fitted. Thus, Audi has always believed in innovating intelligent technology that anticipates drivers’ needs and this they believe is the ‘Vorsprung durch Technik’ that literally translates to “advancement through technology”. In the new Audi A8 L, Audi engineers have not only challenged convention but they have pioneered it. Almost 30 years ago, Audi gave the world the first quattro® - a permanent all-wheel drive system for passenger vehicles. Today, quattro® plays an essential role in the Audi experience and is considered an engineering legend. Audi quattro® drive distributes power to the wheels that need it most, improving control during inclement weather and performance driving situations. In short, it creates a distinct advantage for everyday driving by better distributing the engine's power. That’s intelligent driving. 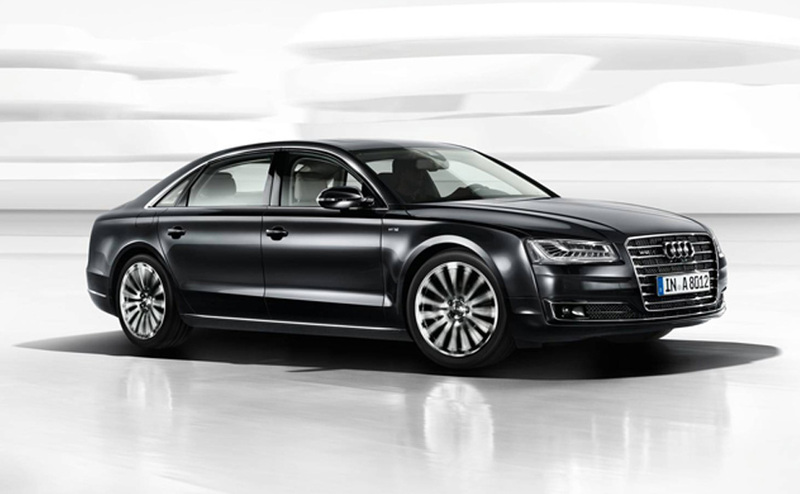 The new Audi A8 L has been built around the philosophy of enhanced and dynamic performance. To bring this to effect, Audi engineers have used ultra-lightweight technology to reduce weight to increase performance. Both Audi Space Frame ASF® aluminum construction and aluminum hybrid construction exemplify this; increasing structural strength, while reducing mass. A car is not only tested for its ability to vroom from 0 to 100 in seconds but also the capability to break even at high speeds and still be stuck to the road. Audi leaves no stones unturned in this area. The high ventilated disc brakes engineered to last for a long time and the anti-lock braking system with Electronic brakeforce distribution gives enhanced control and boosts the stopping power. Audi A8 L has thus defied convention and pushed performance to the limits giving the world a product – a legend in the making.